As I mentioned in my last post, my next project to make is the bombshell swimsuit, hopefully in time for my holiday, which is 2 weeks today! 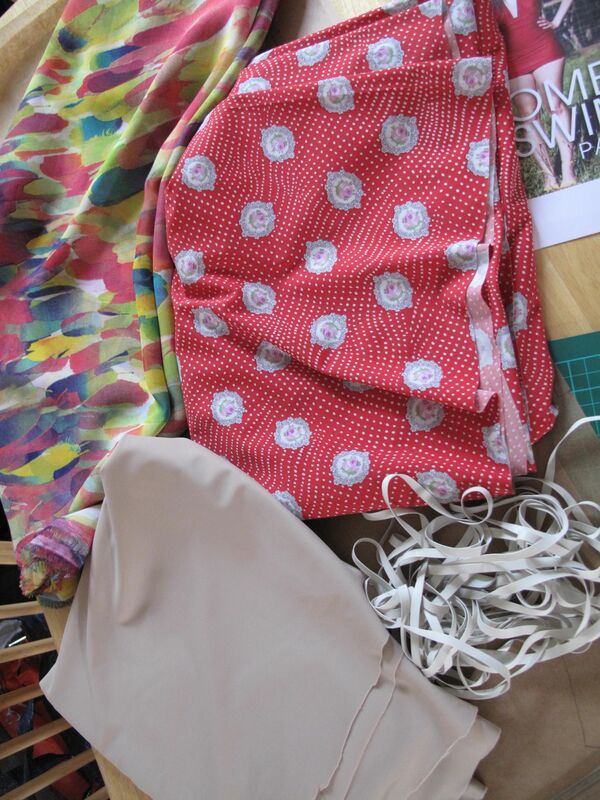 So I took a trip to Fabricland in Reading yesterday to pick up some suitable swimsuit fabric. I was originally aiming for something along the lines of polka dots – I didn’t want anything with more than just a simple pattern. They did have some red polka dots, although the dots were smaller than I ideally wanted. 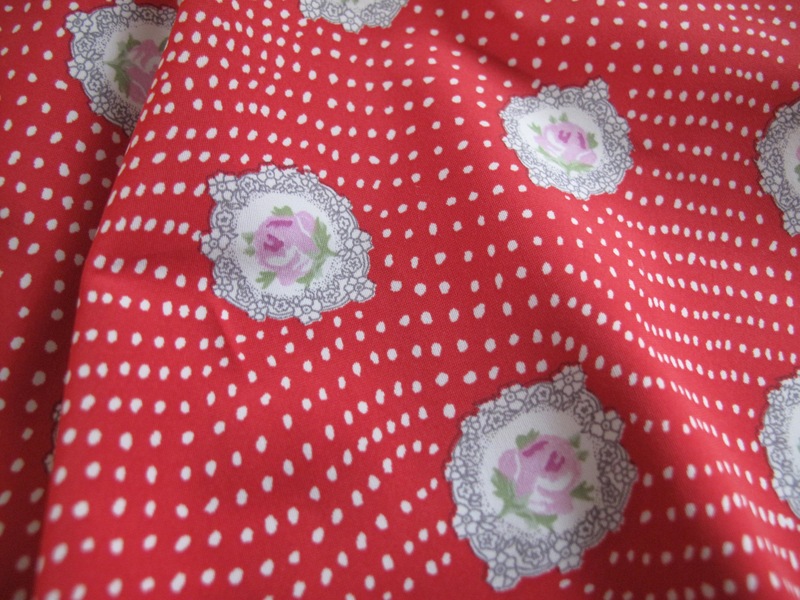 But I also found this lovely rose print spotty red one, and decided that was the one! I managed to get everything I needed for the swimsuit – lining fabric and swimsuit elastic, which I actually managed to get in the 1/4 inch rubber variety that Hethar Lou suggests. I also bought this lovely colourful chiffon fabric, with I’m going to make into a sarong for the holiday. I also learnt a lesson yesterday about measuring. When I looked at the size chart for the bombshell pattern, I saw that my measurements put me exactly halfway between the 10 and the 12. I saw advice that Heather Lou had given someone else on her blog, to go for the bigger of the two sizes, if this is the case. 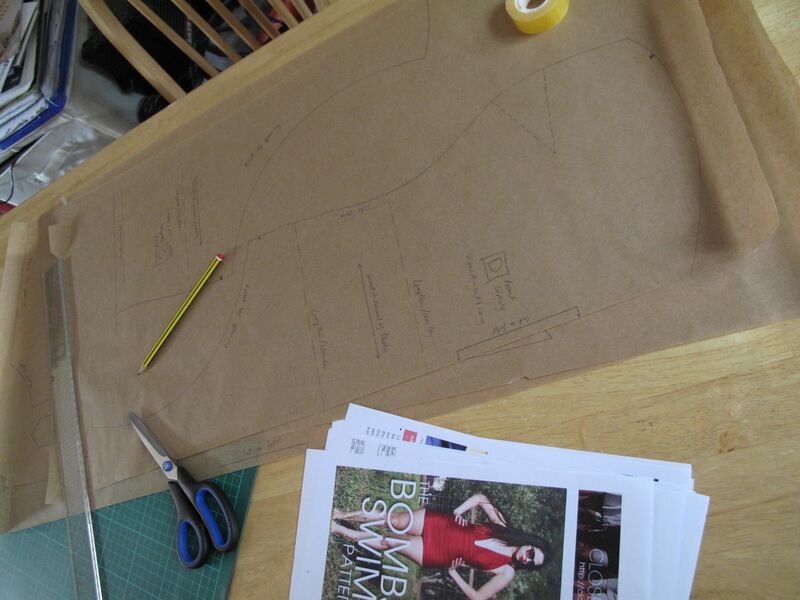 So I spent Friday evening carefully tracing out each of my pattern pieces in a size 12. In order to make sure nothing moved, I taped each of the printed, stuck together pattern pieces to our dining table (really now it’s just my sewing table), and taped greaseproof paper on top. Yesterday, I then decided to check my measurements again. I knew I’d lost an inch off my waist since I first took my measurements at my sewing class, which I had taken into account, but I found out yesterday that I’ve also lost an inch off my bust and my hips since those measurements were taken. This puts me spot on the size 10 pattern measurements. 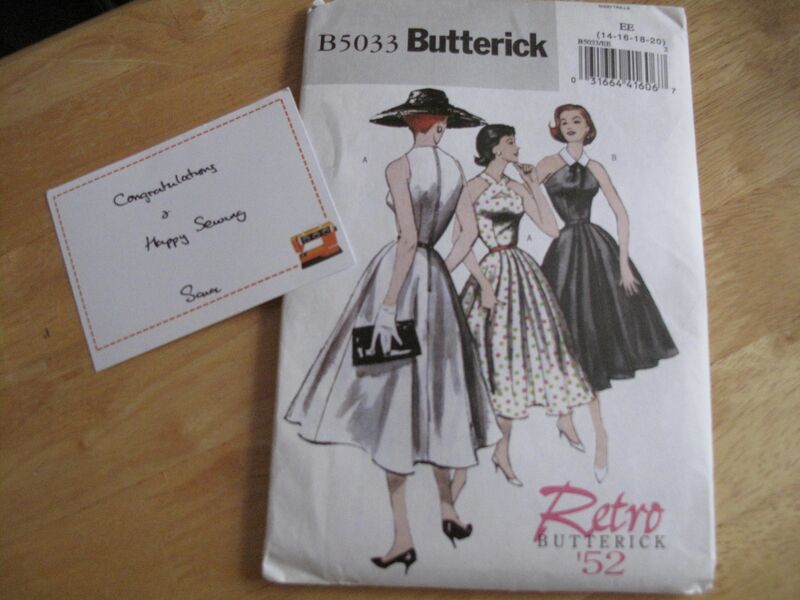 That would also explain why my dress that I’ve just finished is slightly looser on the top half than I’d like. Why I didn’t think to remeasure myself before I traced all the pattern pieces I don’t know. The 30 seconds it would have taken would have saved me from now having to spend this morning doing all my sticking down again, and retracing bits of all my pattern pieces. Grrr. 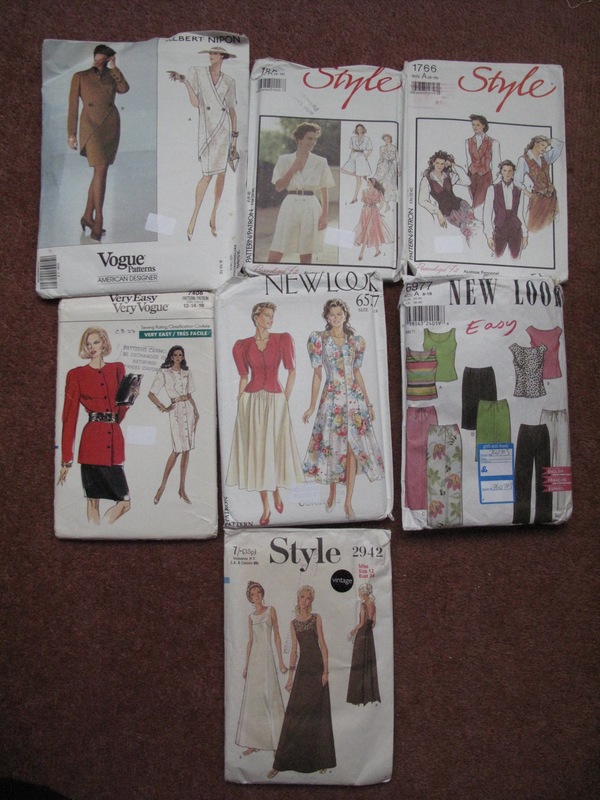 But on the plus side, at least I hadn’t yet cut out the pattern pieces, let alone the fabric. And it’s taught me a lesson! I knew I’d lost some weight (due to my diet at the moment of not eating any sugar; I’m really not a dieter, and this is largely for health reasons, but losing a bit of weight is an added bonus. Also, it’s really not been as hard as I was expecting, given I have a massive sweet tooth.) and so it was just daft not to remeasure myself! After I’ve retraced the pattern, I hope that I can actually get on to cutting out my fabric today. And I’ll have something to work on at my sewing class on Tuesday now! In other news, the lovely Fiona of Diary of a Chainstitcher has nominated me for a Liebster Blog Award! Thank you Fiona, it’s so nice to know that people are actually reading (and enjoying!) my blog. So there’ll be a post on that coming shortly, just as soon as I’ve come up with answers to her questions! For now, my bombshell awaits! Happy sewing!